1-18-08. Overnight. Cheese. Paramount's monster movie from producer J.J. Abrams and director Matt Reeves went by many names while it built up a Godzilla-sized hype over the summer and fall of 2007. The project's marketing was a fascinating experiment in word of mouth for the new age of social media — would the audiences of 2008 turn out for a movie with no A-list stars, no advance look at its central creature, and until the last minute… not even a title? Of course, the movie eventually did get a title — a single, mysterious word that would become the signature of maybe the strangest franchise in the modern cinema landscape: Cloverfield. The movie, as it turned out, was pretty good. Nevertheless, fans ended up having an eight-year wait for a sequel's surprise arrival. When it did finally appear out of the blue, 10 Cloverfield Lane raised more questions than it answered, particularly in regard to its relationship with its predecessor. Abandoning the first movie's setting, cast, found footage style, and monster, it had no connections to the first Cloverfield at all… or did it? 10 Cloverfield Lane tells a small story designed to stand on its own, but it's also deceptively full of complex plot twists, potent but understated themes, and a few hidden ties to a larger Cloverfield mythology. Let's unlock this bunker of secrets and explain the ending of 10 Cloverfield Lane. Though they seem to have nothing in common on the surface, a look back at Cloverfield may provide some clues about the aims of 10 Cloverfield Lane. The original movie is about a giant monster's arrival in New York City, yes, but that's really just a backdrop for the focus of its story. Through its found footage conceit, Cloverfield provides a snapshot of the drama among a group of twenty-somethings sending off their friend Rob (Michael Stahl-David) as he prepares to move to Japan to start a new job. 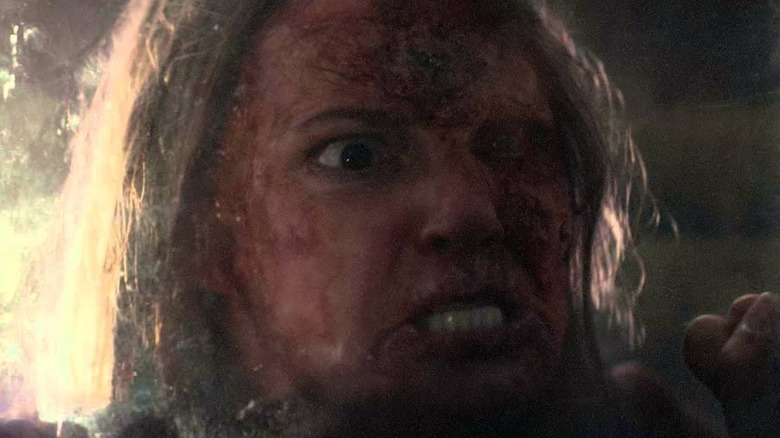 The creature's rampage begins just after a particularly volatile fight between Rob and his would-be girlfriend Beth (Odette Yustman), sending the group on a terrifying trek across town in a desperate effort to rescue Beth from her devastated apartment building. Cloverfield's inventive first-person angle on a classic Godzilla formula makes it an effective thrill ride, but it's the naturalistic depiction of young adults in 2008 America that gives it a surprising amount of weight. Their problems are petty, for sure… but rather than making them obnoxious, this just makes them more relatable. Parallels can even be drawn between the original 1954 Godzilla's allusions to Hiroshima and Cloverfield's portrait of documentation-obsessed New Yorkers living in the shadow of 9/11. In short, it's a giant sci-fi blockbuster interrupting an intimate indie drama about people struggling with regret. Their perspectives are shaken and shaped by unimaginable horror, making their real needs clear for the first time. That brings us to the sequel. 10 Cloverfield Lane introduces us to a heroine in a hurry. In the opening sequence, Michelle (Mary Elizabeth Winstead) is anxiously packing a suitcase, her eyes darting to the stormy horizon outside. Is she desperate to escape a monster invasion? No. As it turns out, she's fleeing from an ill-fated proposal and ignoring calls from her boyfriend (a vocal cameo from Bradley Cooper). Leaving behind an engagement ring and taking a bottle of whiskey, she hits the highway out of New Orleans. In the midst of the drama that will soon follow, it might be easy to lose track of just how much is being set up about Michelle's character here, without her saying a word. The fashion sketches seen strewn around her apartment, the radio news reports (which she barely notices) about massive blackouts, and even the bottle of whiskey are all elements that will pay off later. Most importantly, we learn from her boyfriend's voicemails that she has an apparent chronic problem with commitment. It's clear that his words strike a chord with her, as she grows increasingly distracted listening to his voice from behind the wheel. So distracted, in fact, that she's totally unprepared for the truck that sideswipes her into a violent wreck. Michelle wakes up in a strange cinderblock room, half dingy unfinished grey and half painted pink in some sort of sad attempt at cheerful femininity. She's hooked up to some sort of IV drip and her leg, injured in the crash, is in a brace. But the brace is chained to the wall — someone has saved her life, but is also holding her captive. That someone is Howard Stambler (John Goodman, in a terrifying career-highlight performance). Howard soon explains that he's taken Michelle into his private underground bunker in the aftermath of some sort of attack. He's fuzzy on the details, muttering theories about everything from Russians to Martians. Howard has known for years that something was coming, though, and has been preparing for this day for years. Michelle's room, we gradually learn, was supposed to be for his daughter, Megan. "Her mother turned her against me," Howard explains, in the disturbingly familiar language of abuse. Just as the original Cloverfield used an online "Alternate Reality Game" to enhance its world-building, Lane offered fans an early look into Howard's backstory, if they were willing to look for it. In the lead-up to the film's release, messages from Howard to Megan appeared on a "secret" website. The game also shed some light on Howard's history of employment with Tagruato, the corporation that hired Rob. None of these clues are essential to the understanding the plot of 10 Cloverfield Lane — nor do they give any definitive answers to the franchise's mysteries — but they do provide some intriguing insights about this frightening character. Before she can come to any conclusions about whether or not she trusts Howard, Michelle becomes aware of a third person in their midst. Emmett (John Gallagher Jr.) is a young man who helped build Howard's bunker and made his way to it as soon as loud sounds and lights in the sky signaled the onslaught of whatever invasion has occurred. Definitely friendly — if a little naïve — Emmett quickly becomes Michelle's ally in solving the bunker's mysteries. It may not be immediately clear, but Emmett serves a few functions in the story. His most obvious purpose is to give Michelle support and someone to talk to as she navigates her situation. He also provides some important exposition, informing Michelle (and the audience) that Howard was always known for his doomsday prepper mentality and eventually sharing an important revelation about a photo that Howard claims is of his daughter, Megan. Most ominously, it's significant that Howard seems to barely tolerate Emmett's presence. Howard's consistent irritation toward Emmett suggests that he has more specific goals with the bunker than saving lives. Unsurprisingly, Michelle remains hesitant to trust the man who chained her to a wall and told her Martians may have attacked. She remains not entirely convinced by his stories, even after he brings her to the bunker's heavy, locked door to show her a pair of mutilated pigs outside, as evidence of what the air itself will do to anyone who breathes it. So, at the first opportunity, she bashes him in the head, grabs his keys, and makes a break for the door. But before she can open it, she's met by a woman (Suzanne Cryer) begging to be let in, screaming and desperate as the skin seemingly melts from her face. Fully convinced that the air outside is indeed dangerous, Michelle resigns herself to remaining in the bunker. The decision is made easier by a seemingly softened attitude from Howard, who talks her through the process of stitching up the head injury she caused while sharing stories about his time in the Navy. For instance, he reminisces about using liquid nitrogen to snap off door locks as he uses the very same trick to chill some of his home-distilled vodka. They soon enough move on from the disturbing death they've witnessed, but the memory lingers over the film until the very end. As the only two people who can relate to each other (the only two in the world, in fact, as far as they know), Michelle and Emmett naturally end up sharing stories about their lives before the bunker. They talk about tattoos they've always wanted, with Emmett saying that he would've gotten so many if he'd known that the "attack" was going to happen. When asked if he has any regrets, Howard replies that he's done everything he ever wanted to do, which is simply build the bunker and be "prepared." Later, after the occurrence with the woman at the door, Emmett tries to comfort Michelle by assuring her that there was nothing she could've done to help. This brings up more talk of regrets — Michelle is haunted by the time she saw a little girl being abused by her father and did nothing to help, while Emmett's life was changed when a lack of confidence stopped him from getting on a bus to start college at Louisiana Tech. Michelle and Emmett settle in for life with Howard, though the peace remains uneasy. In a particularly uncomfortable game night, Howard fails to associate the word "woman" with Michelle, struggling with words like "girl" and "princess." It's a disturbing indication of how much he's infantilized her. The tension comes to a head when Michelle, tasked with crawling through the bunker's vents to fix an air filter, discovers a window to the outside into which someone has scratched the word "HELP." Nearby, she finds a bloody earring, which she recognizes from Howard's photo of Megan. But when she shows the picture to Emmett, he recognizes the girl not as Megan, but as a classmate of his little sister's who disappeared from the area some time back. Regardless of how correct he might be about the dangers outside, it's now clear to Michelle and Emmett how dangerous Howard is. He's been using the bunker to hold young women captive in a deluded attempt to replace his daughter — and Michelle is next. Michelle has a plan. With her skills in fashion design — foreshadowed throughout the movie by her magazines and the drawings in her apartment — she envisions a makeshift hazmat suit constructed from the bunker's shower curtain and various household items. She and Emmett begin assembling the materials while evading Howard's notice. Unfortunately, it doesn't work for long, and Howard calls the two of them to help him move a barrel. Inside the barrel is perchloric acid, a fuel component capable of dissolving human bodies down to the bone. Howard makes it clear that he knows that Michelle and Emmett are up to something, and that if they don't confess, they'll end up in the barrel. Emmett accepts all responsibility for the plan, and Howard accepts his apology by calmly shooting him in the head. Howard insists to a shocked Michelle that, like everything else, he's done this to protect her, and that "it was always supposed to be this way." Soon after, he undergoes some sort of bizarre Dad Transformation, appearing cleanshaven and neatly-dressed for the first time as he offers Michelle ice cream. The uneasy tension of his demeanor has been replaced by an even more terrifying sense of total, unchallenged delusion. But Michelle's real call to action comes in a silent scene that finds her going through Emmett's belongings and finding the bus tickets to Louisiana Tech he'd been holding onto for all these years. Her resolve is bolstered. 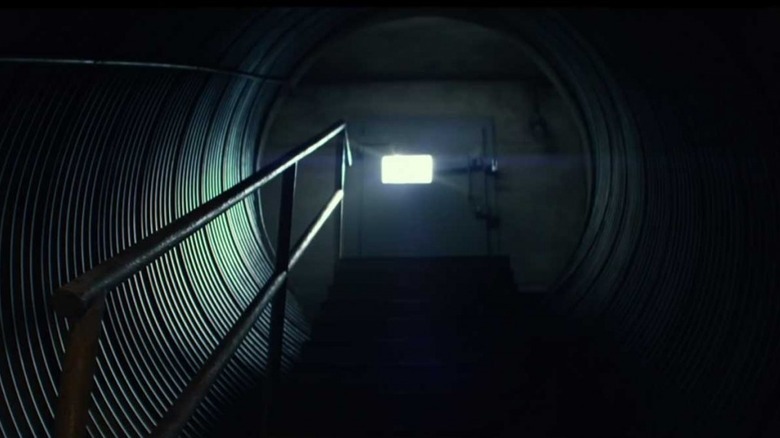 With the uncertainty of the world outside, leaving the bunker is less about saving her own life than it is about not letting regret define her death. The film's climax kicks off when Howard discovers Michelle's nearly complete hazmat suit, and she narrowly escapes his wrath by momentarily trapping him under a supply shelf. When he breaks free and corners her near the perchloric acid (where Emmett's remains can briefly be seen mid-dissolve), she has no choice but to push a barrel over, sending him to the floor and starting a fire as soon as the acid hits an electrical outlet. Fleeing through the vents from a burned and furious Howard, Michelle uses the can of liquid nitrogen to break the exit's massive padlock and at last escape, just before the entire bunker explodes. This final flight out of the bunker is fast and intense, but a careful retracing of the movie's plot reveals just how much of it has been set up all along. Michelle has successfully constructed a hazmat suit, thanks to her interest in fashion design that's part of her character from the very beginning. Her knowledge of the ventilation layout is established by the earlier filter repair sequence — one of the film's most intense moments in its own right. And the liquid nitrogen trick was subtly foreshadowed by Howard's casual aside about doing the same thing in the Navy. Michelle has spent her time in captivity learning everything she needed to survive. In the open air of Howard's farm, Michelle briefly panics when a hole tears in her suit. But the sight of birds flocking overhead, unharmed, tips her off that the air may not be as toxic as she believed. Sure enough, she removes her makeshift plastic bottle facemask and can breathe without trouble. But then a horn sounds nearby, alerting her to the presence of an enormous alien craft sailing over the crops. Michelle's reaction perfectly sums up what the audience is probably thinking: "Oh, come on." As darkness falls, another ship rises up from behind the house, and an enormous tentacled beast emerges. Michelle takes shelter in Howard's truck, and though the creature lifts it up and nearly devours her, she has one more trick up her sleeve — and it's yet another plot point set up in the movie's earliest scenes. With the bottle of whiskey she took with her when she left home, she fashions a Molotov cocktail that not only burns the alien, but causes a chain reaction with the gases in its body, obliterating the monster in a huge explosion. The sudden twist revelation that there really is an invading force — and that it really is something from beyond the stars — is an unconventional turn for a story to take in its final minutes, when its human drama seems all wrapped up. It was a divisive moment for audiences, sparking some controversy among 10 Cloverfield Lane's otherwise positive reviews. Of course, the moment doesn't come totally out of the blue, as Howard had indeed postulated the notion of alien invasion as one of his many theories. One of the most chilling things about the story is the idea that a dangerously unhinged conspiracy nut can be revealed as an absolute monster (they do "come in many forms," as the poster reminds us), but might still be right. 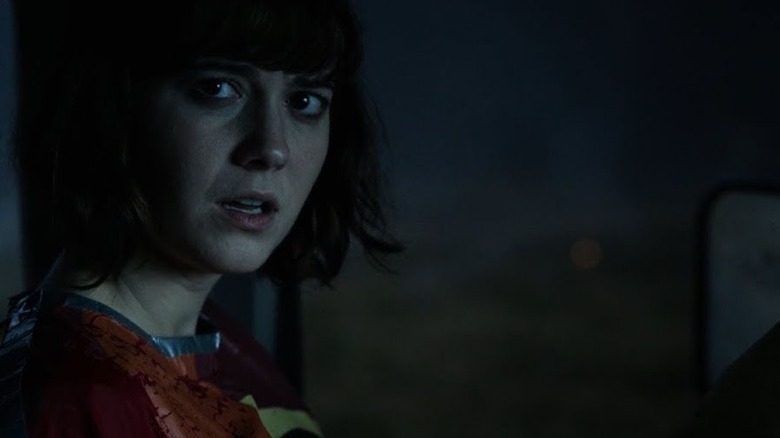 The most important reason for 10 Cloverfield Lane's surprise final sequence, though, is to bring Michelle's character arc to a significant final moment. She commandeers the car left behind by the woman at the bunker's door, at first following radio instructions for survivors to gather at Baton Rouge. But when an open call comes through for anyone with "combat training or medical experience" to join volunteer efforts in Houston, she stops the car. Silently reflecting on how everything that's happened to her has given her exactly the necessary skills, she turns toward Houston, as stormy skies reveal more ships looming in the distance. The movie ends on this moment of decision, with our heroine barreling toward danger. It's far more than open-ended sequel setup, however. It's the first time Michelle has committed to facing a problem head on instead of running from danger or difficulty. We've watched her go from a scared, uncertain person racked with regret to a decisive, competent hero ready to give herself over to a noble cause. Everything about her time in the bunker, her battle with Howard, and her honesty with Emmett has brought her to this place. Though director Dan Trachtenberg set up 10 Cloverfield Lane to stand alone, he liked to think of it as "a badass little origin story." Commenting to io9 about the ending, Trachtenberg explained, "It isn't going into the sunset and everything is going to be okay. In fact, things are going to be potentially worse, but she's ready to face it. That is the theme of the movie for me." If 10 Cloverfield Lane is indeed the origin story of a hero who will go on to increasingly thrilling exploits, does that mean we'll see Michelle onscreen again? Mary Elizabeth Winstead is up for it, but the future remains uncertain. A third Cloverfield film did arrive in 2018, but in keeping with the anthology format established by its predecessors, it shifted focus yet again to an entirely new story and cast of characters. In The Cloverfield Paradox, an experimental particle collider on an international space station inadvertently causes all kinds of reality-warping weirdness… and unleashes monsters upon the Earth. Paradox does, however, include more obvious connective tissue to the larger Cloververse than ever before. In addition to the "Slusho!" 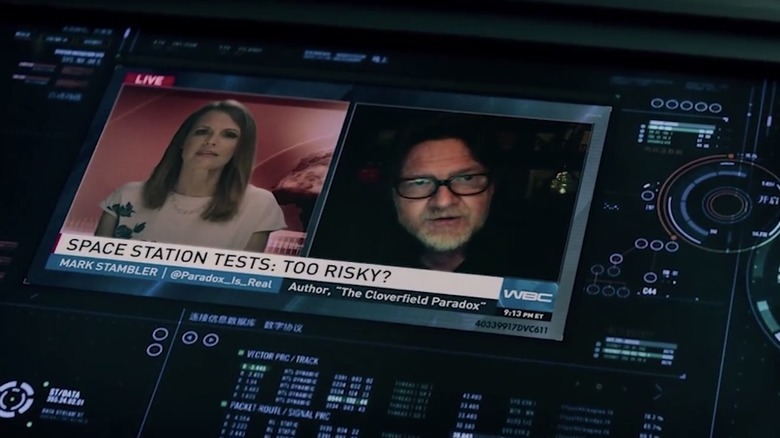 Easter eggs featured in the first two films (and much of J.J. Abrams' other work), a TV pundit named Mark Stambler (Donal Logue) can briefly be seen discussing the dangers of the collider test. Fans were quick to speculate that this is Howard's brother, similarly concerned with conspiracy theories but seemingly far less unhinged. The biggest revelation in The Cloverfield Paradox, though, comes in its very last shot, when one of the creatures that have been spoken of but as-yet unseen is revealed to be the original Cloverfield monster. J.J. Abrams and Paradox director Julius Onah confirmed that this was the very same creature seen attacking New York City, just older, bigger, and angrier. If the monster from Cloverfield emerged from the titular paradox, did the aliens encountered by Michelle share the same origin? Well, maybe. It's difficult to pin down the exact narrative arc of the Cloverfield franchise, partly because its development keeps happening, seemingly, by accident. 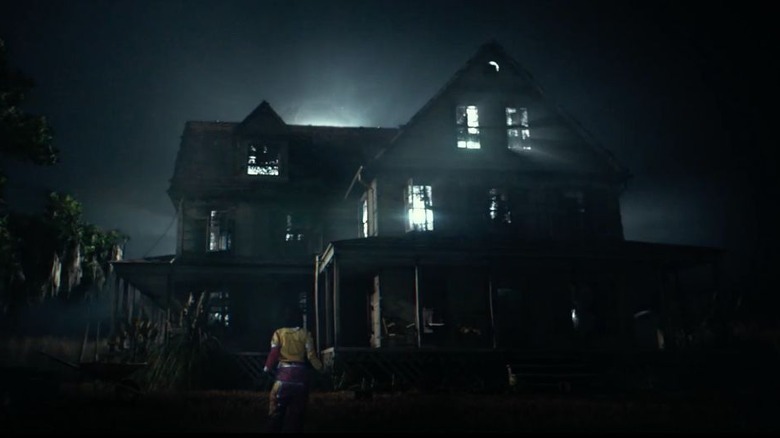 10 Cloverfield Lane started life as a low-budget indie thriller called The Cellar, while The Cloverfield Paradox was developed as God Particle before the original monster was added to the mix. The 2018 Nazi-alien adventure Overlord was initially suspected to be a Cloverfield movie (mostly because of the involvement of producer J.J. Abrams), but that turned out to be untrue. While they seem to have very little in common, the Cloverfield movies are each strengthened by their place in the anthology. The most obvious connection is Abrams' role as producer, but there are thematic parallels as well. 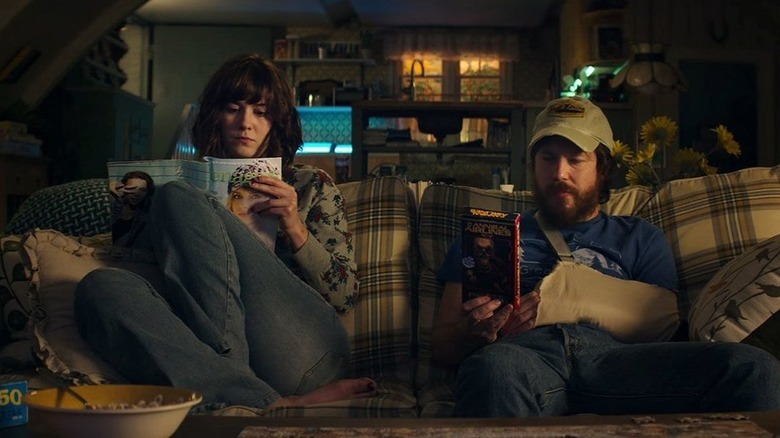 The Cloverfield stories are about very real humans thrust into sci-fi situations, shining new light on their everyday struggles with relationships and regrets. They are calls to action — reminders that giant monsters or invading aliens or inter-dimensional wormholes probably aren't coming to make us think about what matters… but maybe we should live like they are.